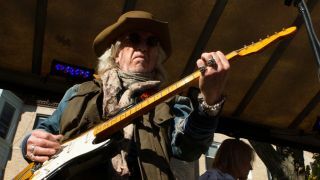 Aerosmith's Brad Whitford on too many guitars, Joe Perry and Music From Another Dimension! "We still have our original members, and we've seen our ups and downs"
"I'm still enamored with guitars," says Brad Whitford, "and I'm still out there buying them, although I don't need to. " Between illnesses, surgeries, injuries and rehab stints, along with an extended, well-publicized squabble between singer Steven Tyler and guitarist Joe Perry, a lot of people were betting against Aerosmith during the last few years. When asked if he ever had serious concerns as to the future of the band, guitarist Brad Whitford lets out an amused sigh and says, "For us, it all becomes second nature." For years, Whitford has been something of a secret weapon for the Boston-based quintet, churning out locomotive-like rhythm guitar, taking more than the occasional stand-out solo and, as a writer, putting his stamp on fan favorites such as Nobody's Fault, Last Child and Permanent Vacation. On Music From Another Dimension!, Whitford's name is on a trio of massive rock beasts (Lover Alot, Sweet Jesus, Beautiful) and a catchy-as-the-flu country-style power ballad (Can't Stop Lovin' You) that features Carrie Underwood. "Hey, I try," Whitford says with a chuckle. "I'm getting better, I guess." Several weeks ago, Joe Perry sat down with MusicRadar to talk about the new album and the state of union that is Aerosmith, and now it's Whitford's turn. In the following Q&A, the guitarist weighs in on band drama, trading licks with Mr. Perry, working with longtime friend and producer Jack Douglas, and whether he ever feels overwhelmed by owning so many guitars. The turbulence in the band was such news leading up to the new album, but you seem to take it in stride. "You know, we still have our original members, and we've seen our ups and downs - Tom with his throat cancer and, you know, a general volatility. But volatility is a unique issue, because when I first joined the band, back in 1971, there was tumultuous fighting going on. There was even a period where I'd come off stage, grab my bag and my clothes, and I'd go somewhere other than the dressing room to change. It got pretty ugly. "But we were battling technology at the time. There wasn't much in the way of monitors for Steven, and Joe and I were playing out of Marshall stacks. We had a tendency to play pretty loud. We had a lot to work through. Steven would have to fight to hear himself. There wasn't a lot of compromise on the guitar players' parts." How would you describe your relationship with Joe Perry as guitarists? "We're very intuitive. We have a natural ability to complement each other's playing. It's kind of come full circle, actually. Joe is playing as well as I've ever heard him. He's been through some rough periods in his life, and it affected his playing, but now he's on top of his game. It makes my life a lot easier when we can both work together the way we do. Certain guitar players I've worked with, either you blend very well or you clash." After all these years, a lot of people think of you as the band's "rhythm guitarist," which isn't true at all. How intact is your ego? "I don't have an overblown part of me that has to stand in special light or do something that I don't feel has anything to do with my true passion, which is just performance. I don't have to stand on the nose of the stage or on the tallest part of the building... or any of that. "What people understand and what they get is honesty in your music. That shines through stronger than anything. It's just like witnessing a great performance by a great actor. It's a matter of letting go and allowing the artistry to shine through. I think I always knew that, the idea that I didn't have to be a flash in the pan. I just needed to concentrate on the gift that I've been given." When I spoke with Joe, he told me that he finds it hard to tell his guitar parts from yours on the new record. To him, this is a good thing - he likes it all to sound like one guy. "I think that's because we've learned so much as players from each other. Our techniques and approaches are really quite different: The way we create music, the way we analyze it, the way we hold picks in our hands, or what we choose to play as far as notes - stuff like that." How about your choices of guitars? If you pick up a Les Paul, will Joe automatically go for a Strat or a Tele, and vice versa? "We've always kind of done that. I've always been very aware choosing different guitars. But there are times when we'll both play Stratocasters on the same song, because we'll know that it'll work, as well." The "getting-it-to-sound-like-one-guy" type of thing? "Yeah. But you know, with Strats, you have so many options. You can almost get a Les Paul sound out of them, and then when you complement that with a cleaner approach, you can do a lot with that." Let's talk about some of the songs on the new record. The track Sweet Jesus is something of a tip of the hat to Toys In The Attic. Intentional? "I never made that connection with that particularly song. The lick itself I've been kicking around for years; it was waiting around, looking for something to latch onto. I have a preference for some of those real upbeat kind of feels, you know?" The song Beautiful has cool guitar all over it - the riff, textures, slide licks. What parts are you playing? "I believe I did the slide part. We double-tracked this Hawaiian slide thing. I think the bluesy riff might have been [co-writer, co-producer] Marti Frederiksen. We were kind of looking for a Guns N' Roses repetitive lick, and of course, it came out of him like water [laughs]. So yeah, I think we left his part on there." Can't Stop Loving You is more than a little bit country. Who are the big country fans in the band? Like a certain bandmate of yours, you've got a lot of guitars. But are there any that have become real go-to models over the years? "We were kind of replicating personality-wise some of the stuff we did in the '70s. I used to have a '68 Les Paul goldtop P-90 guitar that ended up going by the wayside. I've looked all over to try to find a substitute, and I managed to find another one up in Boston. That guitar was a real go-to for the album. There were a few historic Les Pauls that I use quite a bit. I did a lot with the Eric Johnson Stratocaster and a non-trem Strat that was built for the NAMM show in 1982. It's made of pine, it's light as a feather and gets a beautiful, beautiful sound. It's very resonant - it sings [laughs]." With so many guitars to choose from, does it ever get to be a problem? Are you like the proverbial kid in the candy store? "Yeah, it is like that. I'm still enamored with guitars, and I'm still out there buying them, although I don't need to. Really - over the last few months, I've bought three different Les Pauls, all beautiful guitars. I probably play 90 percent of the show we do with a brand-new Stratocaster that Fender just gave to me. I did a little video for them. It's one of the American Vintage Series models, and it's unbelievable. So you never know." Is there a particular guitar you still covet but don't already own? "No, I don't think so. But I am looking for an acoustic. I don't think it'll be too hard to find the right one." Joe told me that he really loves your solo on the song Closer. In turn, what do you really like of his playing on the new record? "Well, the playing is without question. I'd have to say that the songs he put together are really impressive. He's come a long way in his songwriting. I'd have to give that to him." Jack Douglas produced the bulk of the album. He's worked with you guys so much - he really is like the sixth member, isn't he? "Yeah, he is. He fits right in, and we all know one another so well. It's very easy for us to relate to each other. He's very supportive." "Oh, sure. That's what you want someone to do, you know? 'Hey, I know you can do that better' - whatever it is. And, of course, you want to do that for him. Absolutely."